Around the turn of the century, McSherrystown Catholics were part of the largest parish in the colonies-Conewago. The cigar industry came to McSherrystown after the Civil War and with the increased population would bring the request for a Church. In 1890,under the direction of the Jesuits, the men of the area began digging the foundation. On June 1, 1890 (Holy Trinity Sunday) the cornerstone was laid for Holy Trinity Church, which was on the grounds of what was later known as St. Joseph Academy. But, from the beginning there were two serious objections to the church. It was not big enough and it was too far "down town". 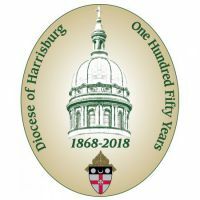 The Jesuits turned the church over to the Diocese of Harrisburg in 1901. In 1901 the bell was taken down and in 1903 Holy Trinity was torn down and the pews and organ were sold to the Catholic Church in Sunbury, PA. In 1898 the Diocese of Harrisburg began the search for land to build a new church. Samuel Stormbaugh left his estate to his brother Joseph with the stipulation that it be used for the Church. When Joseph died in 1897, his will provided for the building of the Church in McSherrystown. The Stormbaugh land at the corner of North and Third Streets was chosen at the approval of Bishop McGovern. Rev. Pius P. Hemler, an Adams County native, was informed that he would be transferred from New Oxford, effective January 1,1899, to McSherrystown to oversee the building of the new church & rectory. H.A. Roby was hired as architect of the project. Construction began in 1899 with the removal of apple trees. On August 16, 1899, men of the parish broke ground for the foundations. On June 2, 1901, Harrisburg Bishop, John W. Shanaghan, D.D. consecrated the church. A few days prior, Fr. Hemler rang the first Angelus, using the bell from Holy Trinity. The cost to build the church and rectory was $41,987.47. In 1900, it is recorded that the parish had 1400 Souls, 30 baptisms, 12 marriages, and 20 deaths. The first baptism that took place was Francis "Jake" Wierman,father of Sr. Ann Marie Wierman, SSJ, who is in residence now. The first wedding was James Conrad and Regina Krichten. The first funeral was John Siegfried. On June 9th newly ordained, Rev. Martin Steffy, celebrated his first mass. In 1905, Fr. Hemler purchased four acres from Henry S. Noel, at a cost of $700 for use as a cemetery. On June 29, 1906, Fr. Hemler died at the church rectory, he was 46 years old. Fr. Hemler was among the first to be interred at the new cemetery. On July 12, 1906 Rev. Dr. L. Augustus Reudter became Pastor until his death in October of 1934. Fr. Reudter was born in Metz, Alsace (Metz, France) and migrated to the United States in 1880. In 1911, Fr. Reudter organized the St. Mary's branch of St. Vincent de Paul society, which is still in existence today. In 1914, he purchased 9 3/4 acres for an athletic field. It was improved and given over to the town community. In the same year there were boys & girls clubs, the Holy Name Society, and other groups organized within the parish. In 1920 a new cross was gilded and added to the belfry, because the original one rotted. New marble altars were added to match the main altar along with new marble statues. In 1921, the whole church was re-frescoed and two years later memorial windows were added. In 1924, Fr. Reudter purchased the circular window of the "Last Judgment" at a cost of $2,130.00. Which was recently renovated for the price of $175,650.00. In 1923, Fr. Reudter took a 10 week trip to Europe and the Holy Land. While there he purchased a large carved crucifix from Bavaria which still hangs in the sanctuary today. The stations of the cross were replaced around the same time. In November of 1930, Fr. Reudter purchased four acres and 23 perches of land from Francis S. Noel at a cost of $580. In 1907 Fr. Reudter erected the St. Mary's Parochial School. It was completed in 1908 at a cost $40,000. John Coulson was the builder. The school housed 8 grades. In 1921 secondary classes were added and in 1924 the first high school class graduated. In 1931, the High School was designated, Central High School and an addition costing $10,000 was added. In 1938 enrollment in the school (grade 1-12) was 600 students. February of 1938, the school was destroyed by fire. In 1938, after the fire, Rev. Patrick McGee was named pastor. Fr. McGee had the school rebuilt. It was blessed on July 2, 1939 by the Bishop George L. Leech. 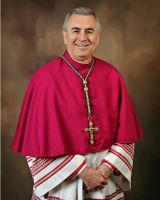 The need for a High School was evident, so the Bishop approached Mr. Charles J. Delone, a catholic attorney in Hanover. Through Mr Delone's donation resulted the building of Delone Catholic High School. Thanks to the dedication of the Sisters of Saint Joseph of Chestnut Hill, many area children received a very good education over many. many years. This is just a brief account of the history of the parish. There is alot more to add than there is room after 118+ Years of existence. Thanks to Mr John T Reily who was a local catholic histrorian at the time of the original building of the church and who also owned a store accross the street from the church. Through his accounts, most of the local history has been preserved.